Everyone should have a 1073 emulation in their arsenal, and when you can get one this good for the same price as a night out, there's absolutely no reason not to. High quality emulation. Slick interface. Individual EQ band bypass. Optional pop-up parameter labelling. Gain-compensated preamp saturation. Cheap! Sonimus has impressed us with its desk emulations, Satson and Britson, and analogue-style SonEQ Pro, and its latest Neve-inspired plugin feels like a logical next step. 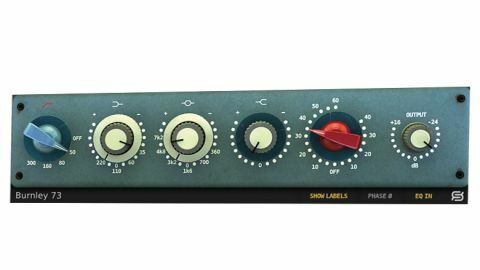 Burnley 73 (VST/AU/AAX/RTAS) emulates both the EQ and preamp of the highly regarded Neve 1073 hardware unit. Arranged as a horizontal unit, from left to right we have an 18dB/octave high-pass filter with notched frequencies (300, 160, 80, 50Hz and Off); a three-band EQ, with low shelf (220, 110, 60 and 35Hz), mid bell (360 and 700Hz, 1.6, 3.2, 4.8 and 7.2kHz) and high shelf (12kHz); preamp saturation; and finally, at the right-hand end, Output level (+16dB to -24dB). Each EQ band offers up to 16dB of boost or cut, and as it's based on the 1073, the bell band Q should narrow slightly at higher gain settings. The saturation knob, which replaces the preamp gain knob of the hardware, is gain compensated, so you simply set the amount of saturation required and the level automatically lowers to compensate. Centred at six o'clock, turning it clockwise engages mic preamp saturation, while anticlockwise introduces line amp saturation. Further options include Phase invert and Show Labels, which pops up gain and frequency readouts. The EQ can also be switched in/out as a whole (EQ In), or on a band-by-band basis by clicking the band shape labels. Finally, all knobs can be set to any of their 'notches' by clicking directly on the value you want. Burnley 73's low shelf and mid bell bands use a dual concentric knob design for frequency and gain settings, very similar to that of the original hardware. The zero point is at the bottom, but with boost still applied with a clockwise motion (and cut anticlockwise, obviously), plus point-and-click frequency selection as noted above, it's intuitive enough nonetheless. As expected, there is a subtle narrowing of the bell Q as you reach higher gain settings, which is particularly good for adding crack to snare drums (4.8kHz and 7.2kHz both work well). Milder settings of a few dB, meanwhile, have broader bandwidth, giving the musical boosts for which the hardware is known. The two shelves are reasonably gentle and have an audible influence on the frequencies both above and below their corner frequencies. So, although fixed at 12kHz, the high shelf acts more like a mid-to-high shelf - great for adding presence, or sweetening the mid and upper frequencies. Meanwhile, the low shelf is great for adding or removing low-end weight - even at its 35Hz bottom frequency, it has influence up to around 200Hz. The saturation control is most useful in its Mic mode, progressing from quite subtle fatness to more complex and sharp. We found it great for adding presence to basses (guitar and synth) and edge to picked electric guitar - it feels almost purpose-built for spicing up DI signals. All told, Burnley 73 is a very high quality plugin that combines good emulation with handy usability features to deliver quality results quickly and easily. Jordan Rudess: "To go from not practising the guitar much at all to trying an eight-string was definitely intense"